A Locked Room Mystery Story: Roderick, Lady Blackwin's beloved Hamster, was murdered. It is up to you to solve the crime and find the killer. MiaW can be finished in half an hour if you rush through the conversations. The game is based on LucasFan's MMM Starterpack. Story & Graphics were done by me, and the midi music was borrowed from several old games. I think this was a pretty fun game , kinda wish it had been longer and better but what is there is pretty good. I agree there should've been more places to explore. "There were a couple of puzzles, that didn't make sense (for example the pulling of the bloody handkerchief out of the laundry tunnel...Why?)" Everything is explained in the end if you're truly paying attention. Wow the graphics are amazing, just what i like in old adventure games plus this font :), you really did awesome job, wish you could make full lenght game, it really has the spirit of best oldschool adventure games :) now i go continue to investigate who killed Roderick may he R.I.P. Okay, I did finish the game now, and except for the damn laundry chute puzzle I managed it without a walkthrough. The graphics are great to look at on screenshots, and still very nice in-game, yet character animations look quite stiff. The dialogue is entertaining and quite funny. The puzzles start out easy, but turn frustrating. There was this piece of cloth stuck in the laundry chute that I figured I need to get out, because why would it be mentioned otherwise? I have like four items in my inventory that would be logical to use for this job, yet the protagonist refuses even a proper explanation why he won't use any of them. Since he also spouts out the same unhelpful lines over again I got quite fed up and quit the game. A shame, really. All the music seems to be ripped from LucasArts classics. I recognized Day of the Tentacle, Indiana Jones and the Fate of Atlantis, and a MIDI version of a Grim Fandango tune. While these are unquestionably great compositions, they take your thoughts back to these great classics, which detracts from the originality of this title. 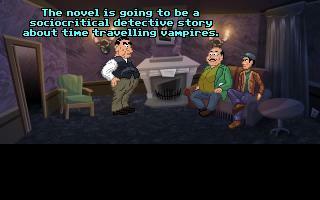 The graphics are very inspired by the style of DoTT, but stand on their own. If you can live with the occasional frustrating puzzle and a protagonists that spouts the same unhelpful phrases over and over again like a robot, you might find "Murder in a Wheel" to be a quite enjoyable adventure. Hello, my name is Joel, from the french AGS forum. I want to translate your game in french. Mhhh... I have to disagree a bit with the other reviewers. The story is convoluted (which isn't bad by itself, since this is a whodunnit game); the thing that I didn't like were the puzzles: many of them seem to be placed there (or be designed in a certain way) only to make the game last longer. This reduces the enjoyment of playing it in my opinion (but mind you, I'm quite bad at puzzle solving). Very, very good, but not excellent. Animation, backgrounds, sound and plot - really good BUT characters need more depth, game is really short...Okay, I know it is a short game, but it took me about 30-40 minutes (WITHOUT walkthrough) to finish it :( It was really entertaining, but short...There were a couple of puzzles, that didn't make sense (for example the pulling of the bloody handkerchief out of the laundry tunnel...Why? :) Good that the string could be used anyware else ;)). It would have been nice if there were a few more rooms to explore and to solve puzzles in them (a creepy, dusty, dark attic would do the trick :P), cause 1.when you see the mansion from the outside, it is obvious it has more than 1st and 2nd floor, and more than 4 rooms (without the 2 corridors). But the whole impression (despite these small thingies ;)) is good. But since it is so short and the puzzles are really easy, this game won't be interesting after the 4th or 5th replay...You should try it though. Especially for beginners in the adventure genre, it is a very good tutorial to get familiar with the point'n'click concept. Superb immersion, even if i think its not very hard to get through the game keeps you focused on it. Very good graphics also and good dialog. Nice to have played a game that reminds me of the old classic oldschool-adventures. The puzzles were just right and the dialogs (as well as the story) funny. I'm looking forward to see your next game..
Amazing puzzles, nice graphics, an original soundtrack would have added to the atmosphere but it's ok.
An extremely good, extremely fun short game which boasts actual detective work. This is an example of what a short game should be like - just because it's short it doesn't mean it has to be obvious, simplistic, easily finished and shelved. 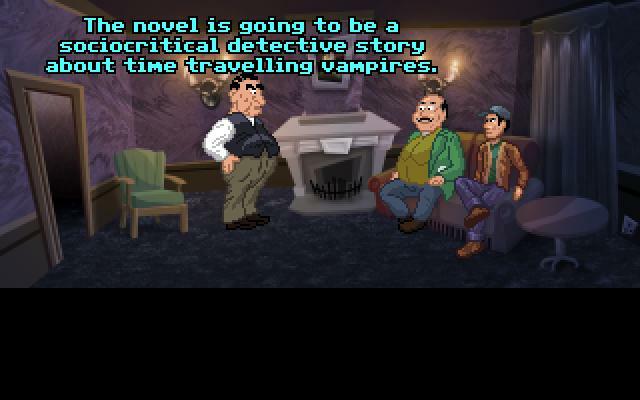 On the contrary, this game is probably the closest I've seen to DoTT style - and manages to pull it off! Excellent backgrounds and sprites. The interactivity was also very good, I mean, there's lots of possible actions and results. Congratulations! Great little adventure I thoroughly enjoyed it! Witty, funny, hilarious! And it translates surprisingly well! A perfect example of a good adventure game. The story is interesting, graphics are wacky and well done, and the puzzles aren't frustrating. Well done! Amazing game, nice graphics, puzzles and animations. Really your backgrounds are marvelous !! really. The puzzles came in sense, and I found it really easy, but that's okay. Great game, I loved the story and the humor, it had fun puzzles, and great graphics. There is also a twist that I didn't see coming at all. I can't wait for more games from you! Very good. I'd reccomend for a quick bit of fun. Great game: good artwork, logical puzzles (it's very difficult to get frustrated in solving the game), the only drawback is the music, that's not original (recycled soundtracks of famous adventures from lucasarts and other companies are used instead). This game is great. Very nice delivery. Probably my favorite short game here. Not to discourage the author since this was a nice little game, but if this is a 10, how would you rate the great games by Wretched, Crystal Shard or Herculean Effort...as 20's? This game is a perfect ten. It features an interesting, non-obvious plot, excellent art (be it borrowed or homegrown, the author makes it all fit perfectly), really original puzzles (all of which are logical), interesting characters and good dialog (I played the original German version, for what it's worth). A fine piece of work. VERY nice game. very detailed, great animations, great backgrounds. What an excellent game! Great graphics and a great story with lots of twists and turns. As I said in "Completed Games"; well done - must play this game!